July 1 Update: A few tickets remain, to be sold on a first come, first served basis at the registration desk at Argyllshire Gathering Halls starting midday, Monday 16th July, cash only (no cards, no cheques). Coach departing and returning to Argyllshire Gathering Halls. Limit 46 tickets. Tour to Auchindrain Township guided by Àdhamh Ó Broin, the Gaelic consultant to the Outlander series and champion of Gaelic language, history and culture. Includes lunch and historical demonstrations, as available. 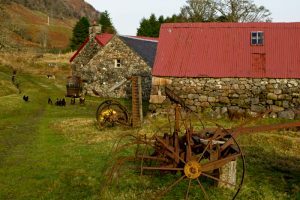 Auchindrain Township is the last traditional Highland township in Scotland, functioning in a residential capacity as a working farm until 1964. In 1968 it was opened to the public as an outdoor museum and has continued in this function since. It is celebrating its 50th anniversary this year. As a member of Auchindrain’s Board of Trustees, Àdhamh is well positioned to give you the inside story on the township, from its early beginnings and a first mention on historical records c1500, through the era of the Jacobite Risings, to Clearance, crofting and the modern age. He speaks the very dialect of the township and can provide insight into the areas flora and fauna while the tour takes place, consisting of a wander round buildings from different eras and in various states of preservation. There were once over 4,000 traditional townships in the Highlands of Scotland. Now there is but one and this is your chance to visit it with your local guide. Hi looking over the description of this tour, in one spot it says lunch is included and then later it says lunch on your own. So is lunch provided? Lunch may be provided, depending upon how many people sign up. A fully booked tour means that we might have enough money to provide lunch. If it’s not fully booked, then fewer people are covering the costs of the infrastructure of the tour (bus, driver, tour guide), which means we won’t be able to provide lunch. Right now, the tour is not fully booked, so you should assume that lunch will not be provided.